GOP presidential hopeful asks: What’s the long-term impact? 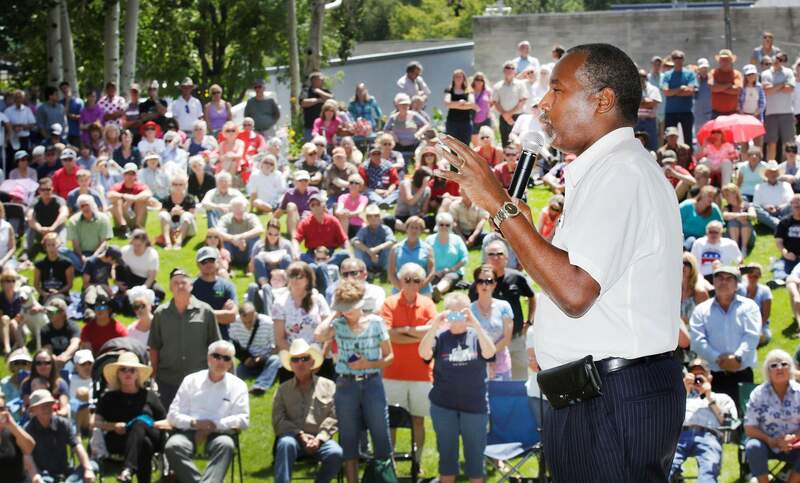 Republican presidential hopeful Dr. Ben Carson speaks to about 2,000 people Tuesday at DurangoþÄôs Rotary Park. Republican presidential hopeful Dr. Ben Carson greets members of the crowd before speaking to about 2,000 people during a campaign stop at Rotary Park in Durango on Tuesday. Ben Carson, republican presidential candidate, makes at stop in Durango speaking to over a thousand people at Rotary Park on Tuesday. Lots of cameras and phones were recording republican presidential hopeful Dr. Ben Carson while he spoke to about 2,000 people Tuesday at Durango´s Rotary Park. Young and old showed up to see republican presidential hopeful Dr. Ben Carson as he speaks to about 2,000 people Tuesday at DurangoþÄôs Rotary Park. 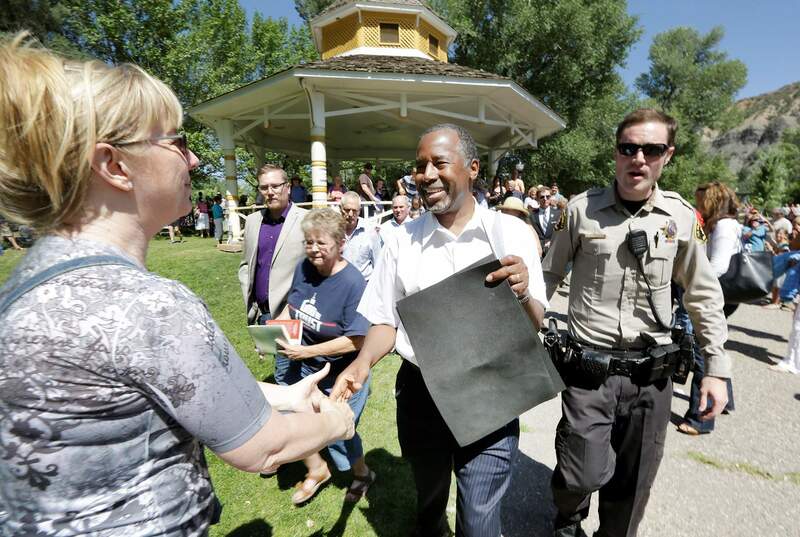 Republican presidential hopeful Dr. Ben Carson speaks to about 2,000 people Tuesday at Durango´s Rotary Park. Anne Markward a concerned citizen came to see republican presidential hopeful Dr. Ben Carson on Tuesday at DurangoþÄôs Rotary Park. 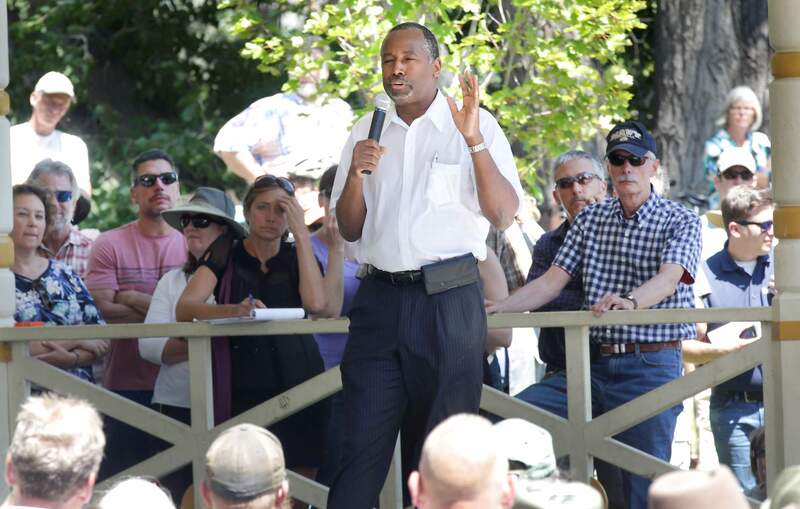 Republican presidential hopeful Dr. Ben Carson, answers a question posed to him Stephen Keno, after speaking to about 2,000 people Tuesday at Durango´s Rotary Park. Republican presidential hopeful Dr. Ben Carson greets members of the crowd after speaking to about 2,000 people during a campaign stop at Rotary Park in Durango on Tuesday. On Tuesday, GOP presidential contender Dr. Ben Carson made a lightning trip to Durango to decry the Environmental Protection Agency before a crowd of thousands at Rotary Park overlooking the maligned Animas River. Based on the sheer throng of supporters Carson attracted and the cheers that met his denunciations of the EPA, the GOP presidential candidate and the Gold King Mine disaster both look poised to play increasingly prominent roles in the Republican primaries. When it came to the EPA, Dr. Carson, a pediatric neurosurgeon who has been surging in national polls since his breakout performance at the GOP debates, didn’t pull any punches, insisting the EPA should be held accountable for its role in the Gold King Mine spill, a position which earned him wild cheers. “I took a helicopter ride to the Gold King mining site this morning and witnessed firsthand” the discoloration and “looked at the environmental impact caused by the EPA,” he said. An EPA contractor doing research at Gold King Mine in Silverton triggered the spill Aug. 5, sending more than 3 million gallons of metal-laden mining sludge cascading through Durango and across three states and led multiple counties to declare states of disaster. Since 1994, Silverton has fought the EPA’s attempts to list the area’s draining mines, which have polluted the Animas River for more than a century, under the Superfund program. Though scientists with the EPA and the Colorado Department of Public Health and Environment now say that metal concentrations in the Animas River have returned to pre-disaster levels, Carson said the larger issue of resulting environmental damage to the Animas is far from resolved. “What’s the long-term impact as metals seep into the ground ... and animals ingest them?” he said. He told reporters after the speech that unlike Gov. John Hickenlooper, who drank a glass of Animas River water to illustrate that the river should be reopened for recreational activities, under no circumstances would he sip from the Animas around Durango. “I certainly wouldn’t tell anyone to drink it. We don’t understand the long-term environmental impacts,” he said. In an interview after the event, he seemed to walk back his comments about firing each of the 17,000 people who now work for the EPA across the country. Carson said he opposed Superfund status for Silverton as it might hurt the town’s reputation. Pursuing Superfund status should be up to the town’s residents, he said. Also, Carson said if he were president, marijuana would be illegal across the country including Colorado. As a neuroscientist, he said, he knows too well the “deleterious affects on the developing brain” and objects to legalizing a substance that sabotages Americans’ intellectual potential. Throughout his speech, Carson repeatedly decried the influence of “secular progressives” on the national debate, which he characterized as nefarious, and cast himself as the opponent of all things politically correct. At other points in his speech, Carson variously denied ever experimenting on fetal tissue, defined gay marriage as an issue for the states, challenged modern-day society’s penchant for “changing everything” given America’s historical greatness as a country, and declared America to be Judeo-Christian nation. At 2,000-strong, the audience that Carson drew early Tuesday afternoon in Durango with only a day’s notice was nearly four times the size of the crowd that showed up to the EPA’s amply publicized public meeting on a Sunday night in the immediate, emotionally charged aftermath of the Gold King Mine disaster. Carson’s speech earned rave reviews from Durangoans. Republican presidential candidate Dr. Ben Carson greets members of the crowd after speaking Tuesday to about 2,000 people during a campaign stop at Rotary Park in Durango. Dr. Ben Carson says he opposes Superfund status for Silverton as it might hurt the town’s reputation. Superfund status should be up to the town’s residents, the Republican presidential candidate told a crowd of about 2,000 people Tuesday during a campaign stop at Durango’s Rotary Park.